On Wednesday, the California Energy Commission unanimously voted to approve new energy standards that will require all new homes in California to have solar panels and other measures geared toward making buildings more energy-efficient. "This is just a milestone. There's a hell of a lot of work to do between now and 2020," said chairman Robert Weisenmiller. "The bottom line is we're going to stay focused on making this happen, and happen smoothly." The commission held a hearing before the vote to solicit public comment from various trade groups. The majority of those present, which included environmental groups, solar companies, and utilities, voiced their strong support for the new standards. At least one manufacturing trade group, however, urged the commission to delay the move. A spokesperson for the Air-Conditioning, Heating, and Refrigeration Institute expressed concern over late changes in the standards that would affect high efficiency air filters and water heaters. In response to the request, a representative for the commission said there's no valid legal basis for the delay. "We understand that we're good to go," the representative said. 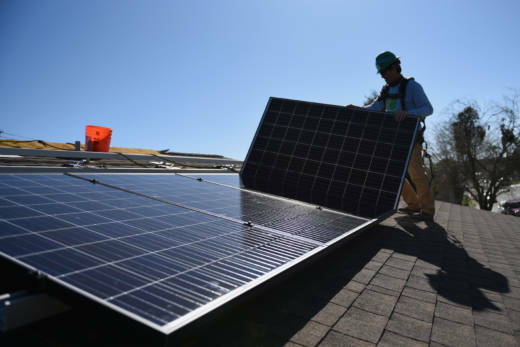 The California Energy Commission is expected to approve new standards on Wednesday that will require solar panels for nearly all new homes starting in 2020, marking an historic leap in the state's efforts to slash greenhouse emissions. The new standards will apply to homes, condos and multi-family buildings up to three stories high. The move would be a key step in meeting the state's ambitious zero net energy goals, says state Senator Scott Wiener (D-San Francisco). In 2007, the energy commission called for all new residential buildings to produce as much energy as they consume by 2020. New commercial buildings have to meet the standard by 2030. Wiener, who led the successful effort to pass a solar mandate for San Francisco construction in 2016, says solar energy is a necessary component of California's zero net energy goals. "In order to achieve zero net energy, you have to have a renewable energy source," says Wiener. "With everything happening in the country right now and President Trump's obsession with coal and the continuing strength of the oil industry, California needs to be aggressive in moving towards a clean energy future, and this is one step in that direction." While the step is significant, California has been preparing for the transition to solar energy for years, according to a spokeswoman for the state energy commission. "We update energy codes every three years and in 2013 we required that all new homes be solar-ready," says spokeswoman Amber Beck. "Homes had to have a certain amount of space on the roof so a homeowner could add a solar panel later on if he chooses." Making California homes more energy-efficient is part of a broader initiative to shrink the state's greenhouse gas emissions 40 percent below 1990 levels by 2030. Electricity consumed by residential and commercial buildings is responsible for 14 percent of the state's greenhouse pollutants, according to the California Public Utilities Commission. Some critics, though, question the wisdom of the transition to solar at a time when California is struggling with a dire housing crisis and skyrocketing housing costs. In San Francisco, only 12 percent of households can afford a median-priced home, according to a recent report by Paragon Real Estate Group. And in California overall, half as many people can afford median priced housing as in the rest of the country. "It absolutely will increase the cost of homes," says Lisa Vorderbrueggen, director of governmental affairs for the Bay Area Building Industry Association. "But on the other hand, increasing the energy efficiency of homes has long been a state priority, so there's no free lunch. We certainly would like to see local jurisdictions reduce costs elsewhere." The energy commission's Beck says the solar mandate will add about $40 a month to the average monthly mortgage payment. But, she adds, the new standards will cut energy use by more than half, and homeowners can expect to save about $80 per month in energy costs over the course of a 30-year mortgage. Wiener, who has made housing affordability a centerpiece of his agenda, says homeowners will also have the option of leasing their solar panels. "You can have a third party come in and install and maintain those solar panels," he says, "so they end up paying for themselves over time." Besides the solar mandate, the new standards to be voted on Wednesday include lighting upgrades for all new commercial buildings and high-rise construction above three stories, a transition that will help buildings use 30 percent less energy. In addition, new ventilation requirements will apply to new homes and healthcare facilities. The measures will protect residents from air pollution originating from outdoor and indoor sources, according to the California Energy Commission.